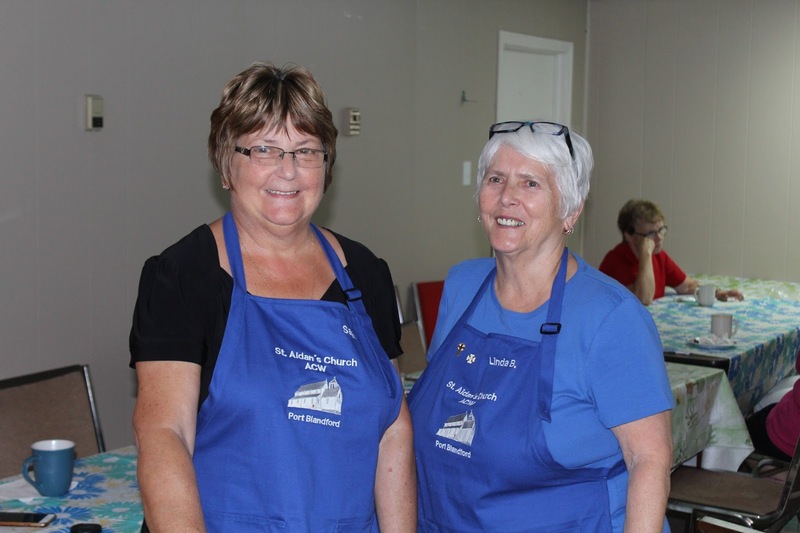 Sarah Greening (L) and Linda Bennett (R) in the basement of the Anglican Church in Port Blandford following a public memory mug up. Photo by Katie Harvey. 2017. On August 10, 2017, as part of the Collective Memories project, I interviewed Linda Bennett of St. John’s about growing up in town, convenience stores, shopping in downtown St. John’s, visiting Port Blandford, the shops of Port Blandford, and moving out from St. John’s to Port Blandford. This interview was also part of our Oral History Roadshow and sections of the interview were used in the booklet “Everything Was Wrapped in Brown Paper: The Old Shops of Port Blandford”. In this interview Linda discusses Harvey’s Convenience which was owned and operated by her father who had a close connection with the Portuguese fisherman who docked in St. John’s harbour. Linda explains how her father became fluent in Portuguese and helped translate for the fishermen. She also describes heading to Port Blandford as a child and the old shops that were in the community at the time. She particularly remembered Hayley’s movie theatre and Pelley’s store where she could try on high heel shoes. If you would like to listen to the full interview on Memorial University's Digital Archives Initiative click here or you can check out the pdf of our booklet on Port Blandford’s old shops click here.